Pelicans are large water birds, instantly recognizable by their large beaks and throat pouches that they use to scoop up prey (mostly fish). 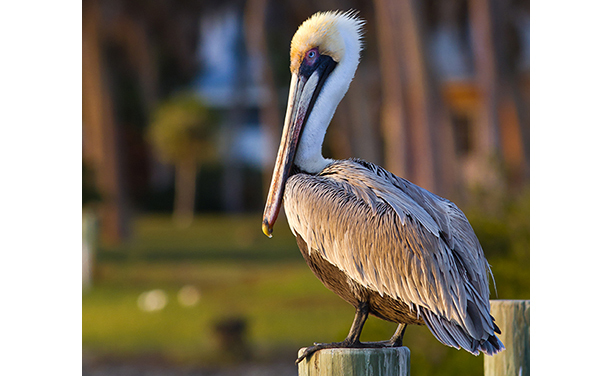 Most species of pelican are pale in plumage, except for their bills, pouches, and facial skin, which becomes brightly colored during breeding season. They are highly social birds, who travel and hunt in groups and breed colonially. Can you imagine spending nearly all of your life in the air? The common swift doesn’t have to - it just does! From the day this bird learns to fly, it almost never touches the ground voluntarily - it eats, drinks, mates, and may even sleep while flying. While sleep walking can be problematic in humans, many birds have the ability to enter a state called unihemispheric slow-wave sleep, where one half of the brain sleeps as the other remains alert. This method of “sleeping with one eye open,” is a great way to avoid becoming another animal’s meal, and has led to the suspicion that these birds, who almost never willingly land, also sleep while in flight!